Changing the color of text in Photoshop Elements 11 is as easy as highlighting it and selecting a color from the Color Picker. But what if you want to do something a little more unconventional, such as apply brush strokes of paint randomly across the type? Honestly, it’s easier than it looks. Again, as with applying filters to text, the only criterion is that the type has to be simplified first. After that’s done, select a color, grab the Brush tool with settings of your choice, and paint. In the example, a rough, dry brush found in the Brushes presets was used. Diameters of 39, 15, and 6 pixels were used. If you want the color or gradient to be confined to only the type area, you can select the text by either Ctrl-clicking (Command-clicking on the Mac) the layer containing the text or locking the transparency of the layer in the Layers panel. In the Photo Editor in Expert mode, select the Gradient tool from the Tools panel. In the Tool Options, click the down arrow next to the Gradient Picker to access the Gradient Picker drop-down panel. Position the gradient cursor on the text where you want the gradient to start and drag to where you want the gradient to end. If you’re not happy, drag again until you get the look you want. Remember that you can drag at any angle and to any length, even outside your type. 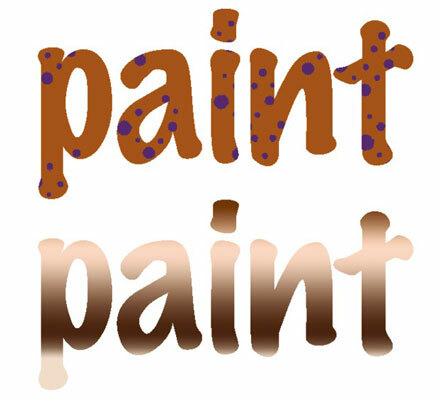 In the bottom image shown, the copper gradient is used and just dragged from the top of the letters to the bottom. The transparent pixels were locked on the layer to confine the gradient to just the type area.